Lisl "The trip was exactly as I envision/expected. The accommodations were OK (would've like more hostel set-ups as opposed to camping sites) and the locations were spot on. The option activities were average. For Lauterbrunnen specifically, I wish there were more options, especially since it rained during our stay. The optional activities were rather expensive for that leg of the trip, but we made i..."
Start in Paris and end in Vatican City! With the discovery tour Western Spirit 2019, you have a 9 day tour package taking you through Paris, France and 4 other destinations in Europe. Western Spirit 2019 includes accommodation in a hostel and campsites as well as an expert guide, meals, transport and more. It was great! Loved it ! The entire trip was amazing! Had so much fun, felt safe the entire time, good was excellent and it was well organized. I would make a point to have Stien as my guide on another tour. Cannot fault Vinnie in any way! Not only was he knowledgable on every city we visited (and as a History fanatic I have a lot of love for that) he kept us entertained on the long bus journeys and knew the right times to let us rest and keep us awake! It was my first time traveling alone and with a company, I was nervous at first but than meeting my tour group and tour guide made it so amazing. We stayed at some pretty nice places and did a lot of fun activities! Chris was amazing!!!! Probably the best tour I'll ever do and will probably remember for the rest of my life. Highly recommend !!! Johnny created a fun and accepting atmosphere among the travelling group. He shared experiences and knowledge and made an effort to get to know everyone. I had the time of my life on this trip! Best tour guide I've ever had. So good, I did another tour in the hopes of getting him again. Paris is the starting point and Vatican City is the endpoint. 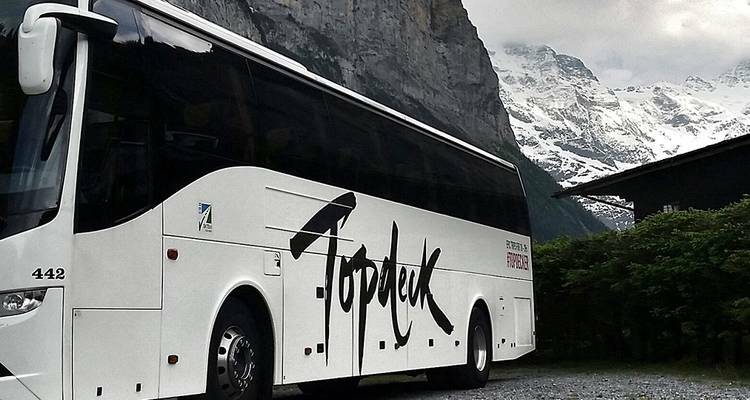 TourRadar only requires a deposit of $99 to confirm this Topdeck booking. The remaining balance is then payable 47 days prior to the departure date. For any tour departing before 7 June 2019 the full payment of $1,343 is necessary. No additional cancellation fees! You can cancel the tour up to 47 days prior to the departure date and you will not need to pay the full amount of $1343 for Western Spirit 2019, but the deposit of $99 is non-refundable. Covering a total distance of approx 1,233 km.